Peter Sculthorpe, 1929-2014 : the ABC recordings. Recorded/performed at: Federation Concert Hall, Hobart, on Dec 02. Peter Sculthorpe Tasmanian Symphony Orchestra, Sue-Ellen Paulsen, Richard Mills 18 mins, 7 sec. Recorded/performed at: Ballroom, Government House, Hobart,Tasmania, on Jun 96. Peter Sculthorpe Tasmanian Symphony Orchestra, Sue-Ellen Paulsen, David Porcelijn 4 mins, 31 sec. Recorded/performed at: Adelaide Town Hall, on Jun 00. Peter Sculthorpe Adelaide Symphony Orchestra, James Judd 5 mins, 57 sec. Recorded/performed at: Sydney Town Hall, on Feb 90. Peter Sculthorpe Sydney Symphony, Stuart Challender 10 mins, 31 sec. Recorded/performed at: Ferry Road Studio, ABC, Brisbane, on Sep 03. Peter Sculthorpe Queensland Symphony Orchestra, William Barton, Michael Christie 11 mins, 15 sec. Recorded/performed at: Ballroom of Government House, Hobart., on Jun 96. Peter Sculthorpe Tasmanian Symphony Orchestra, Peter Sculthorpe, Barbara Jane Gilby, David Pereira, Vanessa Souter, Joseph Ortuso, Mark Atkins, Bruce Lamont, David Porcelijn 30 mins, 20 sec. Recorded/performed at: Adelaide Town Hall Peter Sculthorpe Adelaide Symphony Orchestra, David Porcelijn 3 mins, 40 sec. Recorded/performed at: Adelaide Town Hall, on Jun 00. Peter Sculthorpe Adelaide Symphony Orchestra, James Judd 22 mins, 48 sec. Recorded/performed at: ABC Waverly Studios, Melbourne, on 11 Jul 66. Peter Sculthorpe Melbourne Symphony Orchestra, Leonard Dommett, John Hopkins 11 mins, 18 sec. Recorded/performed at: Eugene Goossens Hall, ABC Centre, Ultimo, Sydney, on Jan 96. Peter Sculthorpe Richard Tognetti, Australian Chamber Orchestra 10 mins, 41 sec. Recorded/performed at: Sydney Town Hall, on Jul 89. Peter Sculthorpe Sydney Symphony, Don Hazelwood, Stuart Challender 11 mins, 20 sec. Recorded/performed at: Sydney Town Hall, on Jul 89. Peter Sculthorpe Sydney Symphony, Stuart Challender 14 mins, 57 sec. Recorded/performed at: Ferry Road Studio, ABC, Brisbane, on Sep 03. Peter Sculthorpe Queensland Symphony Orchestra, William Barton, Alexa Murray, Michael Christie 16 mins, 24 sec. Recorded/performed at: Eugene Goosens Hall, ABC Studios, Sydney, on 31 Mar 95. Peter Sculthorpe Australian Chamber Orchestra, Cameron Retchford, Richard Tognetti 9 mins, 45 sec. Recorded/performed at: Ballroom, Government House, Hobart, Tasmania, on Jun 96. Peter Sculthorpe Sue-Ellen Paulsen, Tasmanian Symphony Orchestra, David Porcelijn 8 mins, 50 sec. Recorded/performed at: Sydney Opera House Concert Hall, on Feb 96. Peter Sculthorpe Sydney Symphony Orchestra, David Drury, Edo de Waart 4 mins, 37 sec. Recorded/performed at: Ballroom, Government House, Hobart, Tasmania, on Jun 96. Peter Sculthorpe Tasmanian Symphony Orchestra, David Porcelijn 6 mins, 48 sec. Recorded/performed at: Sydney Town Hall, on Feb 89. Peter Sculthorpe Sydney Symphony, Stuart Challender 13 mins, 16 sec. Recorded/performed at: Ferry Road Studio, ABC, Brisbane, on Sep 03. Peter Sculthorpe Queensland Symphony Orchestra, William Barton, Michael Christie 15 mins, 16 sec. Recorded/performed at: Adelaide Town Hall Peter Sculthorpe Adelaide Symphony Orchestra, David Porcelijn 14 mins, 11 sec. Recorded/performed at: Federation Concert Hall, Hobart, on 3 Dec 03. Peter Sculthorpe Tasmanian Symphony Orchestra, Richard Mills 3 mins, 56 sec. Recorded/performed at: Sydney Opera House Concert Hall, on Feb 96. Peter Sculthorpe Sydney Symphony Orchestra, Mark Atkins, Edo de Waart 14 mins, 46 sec. Recorded/performed at: Adelaide Town Hall, on Jun 00. Peter Sculthorpe Adelaide Symphony Orchestra, James Judd 15 mins, 55 sec. Recorded/performed at: Adelaide Town Hall, on Jun 00. Peter Sculthorpe Adelaide Symphony Orchestra, James Judd 5 mins, 8 sec. Recorded/performed at: Ballroom, Government House, Hobart, Tasmania, on Jun 96. Peter Sculthorpe Tasmanian Symphony Orchestra, David Porcelijn 5 mins, 47 sec. Recorded/performed at: Federation Concert Hall, Hobart, on Dec 03. Peter Sculthorpe Karin Schaupp, Tasmanian Symphony Orchestra, Richard Mills 21 mins, 19 sec. Recorded/performed at: Melbourne, on 9 Mar 83. Peter Sculthorpe Melbourne Symphony Orchestra, Anthony Fogg, Myer Fredman 22 mins, 15 sec. Recorded/performed at: Sydney Opera House Concert Hall, on Feb 96. Peter Sculthorpe Sydney Symphony Orchestra, Tamara Anna Cislowska, Edo de Waart 22 mins, 45 sec. Recorded/performed at: Ballroom, Government House, Hobart, Tasmania, on 15 Mar 97. Peter Sculthorpe David Porcelijn, Tasmanian Symphony Orchestra, Mark Skillington, Barbara Jane Gilby 3 mins, 31 sec. Recorded/performed at: Ballroom, Government House, Hobart, Tasmania, on Jun 96. Peter Sculthorpe Joseph Ortuso, Tasmanian Symphony Orchestra, Barbara Jane Gilby, David Porcelijn 3 mins, 15 sec. Recorded/performed at: Eugene Goosens Hall, ABC Studios, Sydney, on Jan 96. Peter Sculthorpe Richard Tognetti, Helena Rathbone, Australian Chamber Orchestra, Cameron Retchford 14 mins, 53 sec. Recorded/performed at: Adelaide Town Hall, on Nov 05. Peter Sculthorpe Adelaide Chamber Singers, William Barton, Adelaide Symphony Orchestra, Arvo Volmer 42 mins, 8 sec. Recorded/performed at: ABC Melbourne Music Studios, on 1977. Peter Sculthorpe Melbourne Symphony Orchestra, John Hopkins 6 mins, 7 sec. Recorded/performed at: Sydney Town Hall, on Feb 89. Peter Sculthorpe Sydney Symphony, Guy Henderson, Stuart Challender 6 mins, 11 sec. Recorded/performed at: Eugene Goosens Hall, ABC Studios, Sydney, on Jan 96. Peter Sculthorpe Australian Chamber Orchestra, Richard Tognetti 14 mins, 1 sec. Recorded/performed at: Eugene Goossens Hall, ABC Studios, Sydney, on Jan 96. Peter Sculthorpe Australian Chamber Orchestra, Richard Tognetti 13 mins, 21 sec. Recorded/performed at: Eugene Goossens Hall, ABC Studios, Sydney, on Jan 96. Peter Sculthorpe Australian Chamber Orchestra, Richard Tognetti 13 mins, 1 sec. Recorded/performed at: Sydney Opera House Concert Hall, on Feb 96. Peter Sculthorpe Sydney Symphony Orchestra, Kirsti Harms, Edo de Waart 10 mins, 15 sec. Recorded/performed at: Ferry Road Studio, ABC, Brisbane, on Sep 03. Peter Sculthorpe Queensland Symphony Orchestra, William Barton, Michael Christie 16 mins, 16 sec. Recorded/performed at: ABC Studio 420, Ferry Road, Brisbane, on Sep 03. Peter Sculthorpe Queensland Orchestra, William Barton, Michael Christie 12 mins, 10 sec. Recorded/performed at: Federation Concert Hall, Hobart, on Dec 02. Peter Sculthorpe Tasmanian Symphony Orchestra, Richard Mills 21 mins, 23 sec. Recorded/performed at: Adelaide Town Hall, on Jun 00. Peter Sculthorpe Adelaide Symphony Orchestra, James Judd 23 mins, 27 sec. Recorded/performed at: ABC Waverly Studios, Melbourne, on 1976. Peter Sculthorpe Melbourne Symphony Orchestra, John Hopkins 11 mins, 57 sec. Recorded/performed at: Adelaide Town Hall, on Nov 95. Peter Sculthorpe Adelaide Symphony Orchestra, David Porcelijn 12 mins, 24 sec. Recorded/performed at: ABC Waverly Studios, Melbourne, on 1976. Peter Sculthorpe Melbourne Symphony Orchestra, John Hopkins 5 mins, 1 sec. Recorded/performed at: Adelaide Town Hall, on Nov 95. Peter Sculthorpe Adelaide Symphony Orchestra, David Porcelijn 5 mins, 51 sec. Recorded/performed at: ABC Waverly Studios, Melbourne, on 1976. Peter Sculthorpe Melbourne Symphony Orchestra, John Hopkins 10 mins, 51 sec. Recorded/performed at: Adelaide Town Hall, on Nov 95. Peter Sculthorpe Adelaide Symphony Orchestra, David Porcelijn 10 mins, 7 sec. Recorded/performed at: ABC Waverly Studios, Melbourne, on 1976. Peter Sculthorpe Melbourne Symphony Orchestra, John Hopkins 8 mins, 32 sec. Recorded/performed at: Adelaide Town Hall, on 1995. Peter Sculthorpe Adelaide Symphony Orchestra, David Porcelijn 8 mins, 46 sec. 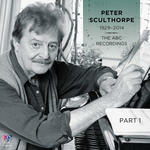 Recorded/performed at: Adelaide Town Hall Peter Sculthorpe Adelaide Symphony Orchestra, David Porcelijn 5 mins, 53 sec. Peter Sculthorpe had a long and fruitful relationship with ABC Classics. In this deluxe box set, the ABC recordings of his music are brought together for the first time to form a remarkable tribute to one of the world's great composers. Sculthorpe created an Australian classical music that for the first time spoke directly of the land, the people and the spirit of this country. His music opened up new possibilities for Australian composers, and brought a distinctively Australian voice to the concert halls of the world. This 10 CD collection celebrates four decades of ABC recordings of Sculthorpe's orchestral music, including the acclaimed Sun Music, Earth Cry, Quamby and Requiem. The iconic performances feature an array of the finest Australian orchestras, conductors and soloists; and the newly-commissioned and extensive note from Dr Graeme Skinner provides a thorough introduction to the music of this revered composer. Also included in this set is the first-ever release of the DVD Peter Sculthorpe - The Quartets, in which the composer surveys his life and career as seen through the prism of his string quartets - as performed by the Goldner String Quartet. Includes substantial booklet with essay and notes by Graeme Skinner. Includes DVD "Peter Sculthorpe: The Quartets" in which the composer surveys his life and career as seen through the prism of his string quartets, as performed by the Goldner String Quartet. Score: Songs of sea and sky : for strings and optional didjeridu / Peter Sculthorpe. Score: Requiem : for SATB chorus, didjeridu and orchestra / Peter Sculthorpe.